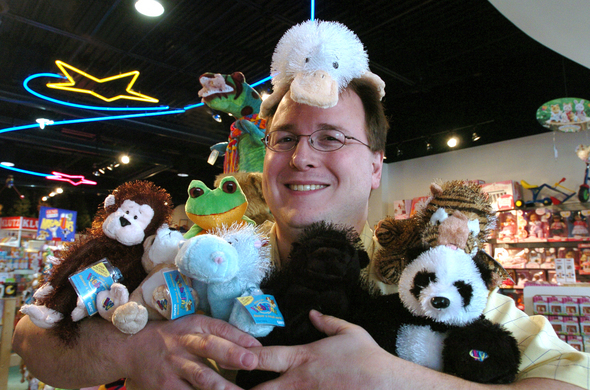 Posted on Mon, Dec 19, 2011 : 11:45 a.m.
Tree Town Toys co-owner Hans Masing, seen here in a photo from a few years ago, said the shop will close within a few weeks. Tree Town Toys, a specialty shop located in the Traver Village Shopping Center on Plymouth Road, plans to close its physical store and operate only online. The store, owned by Hans and Tricia Masing, opened in August 2006 and briefly operated a second location at Briarwood Mall. 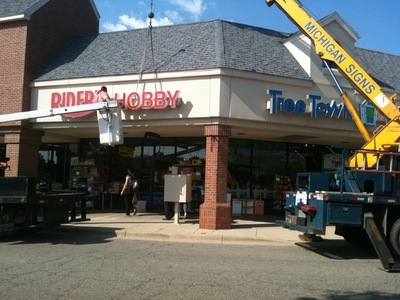 Tree Town Toys earlier this year struck a partnership with Rider's Hobby Shop, which was set to close its store on Carpenter Road. Instead, Rider's moved into the same space as Tree Town Toys, placing two distinct local brands under one roof. Brent Martin, owner of the Rider's store, said he hopes to continue operating his shop and is already in discussions with Ann Arbor-based landlord First Martin Corp.
"Retail is a different business right now as anybody in retail will tell you, but the business is certainly viable," Hans Masing told AnnArbor.com. "It comes down to: We can't give it the nurturing that it needs to thrive right now." The Tree Town Toys owners plan to focus on their Jackson-based business, a separate legal entity called DragonFlyDepot.com, a warehousing business that provides toy fulfillment and logistics to national charitable organizations and 40 stores throughout the country. Masing said the store plans to continue fulfilling orders through TreeTownToys.com for now. Tree Town Toys struck a partnership with Rider's Hobby Shop earlier this year. Rider's moved into the store and hopes to continue operating. "We don't see why not right now," he said. "It all depends on whether we keep our brand alive. We hope to obviously because it's pretty well known." Masing said he and Tricia were becoming overwhelmed with the amount of work it took to maintain Tree Town Toys' physical store, its online store, DragonFlyDepot.com and Hans' separate information technology consulting. "It's frankly turned into 18-hour days," he said. "We have kids and we want to actually participate in physically growing up with them. Something had to give." Masing said the partnership with Rider's Hobby Shop — which is subleasing half of the space within the Tree Town Toys store — did not contribute toward the closure of his store. Martin, owner of Rider's Hobby Shop, which had been planning to close before it reached a deal with Tree Town Toys, described the relationship as cooperative and mutually beneficial. "Definitely at this time our plan is to keep going," Martin said. "The move has worked out well for us. Our customers are finding us more and more." Tree Town Toys has eight employees. Hans said he was "working to keep as many of them with the DragonFlyDepot side as we can," although "many of them are students and they don't want go to Jackson and that's fine." --Michigan's tough economy. Although the state's employment rate fell to 9.8 percent in November, a federal measure of "total unemployment" — which includes people who are underemployed — is currently 19.2 percent in Michigan. "That's one out of five," Masing said. "That's a substantial portion of our economy. So folks have to be bargain driven right now, and the cost of operating a brick-and-mortar store and providing training and customer service and all of the things that are necessary to provide a top-notch shopping experience are more and more difficult." --Federal regulations. Masing said the Consumer Product Safety Improvement Act of 2008 implemented stiff toy safety standards that forced many niche European brands to stop shipping products to the U.S. and forced small U.S. manufacturers out of business. "That was some legislation put into place to make sure toys sold to kids are safe. That's so important. We've always made sure we've had safe toys," Masing said. But "the legislation ensured that only the largest manufacturers could survive. So we lost a number of brands." --Big-box competitors are carrying specialty products at low prices. For example, Walmart recently began carrying a line of animal figurines made by a European company called Schleigh. "They're at Walmart cheaper than I can buy them," Masing said. "I can't compete against that. So we cut the line, find something that's a little more esoteric." Masing said he and Tricia reached their decision on Friday, informed Martin on Friday and told employees today. He described the decision to close as something they've been considering for a while. "This isn't a Friday evening over a couple of drinks, 'Hey let's close the store,'" he said. "It's been on our minds for a bit as we looked at whether we want to renew the lease." Martin said he "was surprised just as much as everybody else" of Tree Town Toys' decision to close, "but our intention is to find a way to make this work." Tree Town Toys, wwhich opened its physical store in 2006 after being online only, quickly became ingrained in the local business community. In a particularly memorable moment in 2010, the store organized a shopping spree for a 7-year-old girl with Huntington's disease who had been cyber-bullied by her neighbors. Tue, Dec 20, 2011 : 4:39 p.m.
Buy local or bye-bye local! Sad news. My son loved TTT. Local shops are just so important to the local economy. The money spent here stays here. So many small retailers have gone by the wayside. Will tomorrow's children have any memories of trips to the toystore? Tue, Dec 20, 2011 : 10:39 p.m.
More like a trip thru the internet to get the toys they want. Hey mom! Here is a picture of what I want for Xmas. I will email it to you. Not. I really hate Toys R Us. Very pricey. So glad mine is out of toys and we have a lot of stuff for her generation. Not playing with safe toys mind you. &quot;--Federal regulations. Masing said the Consumer Product Safety Improvement Act of 2008 implemented stiff toy safety standards that forced many niche European brands to stop shipping products to the U.S. and forced small U.S. manufacturers out of business.&quot; No comment required. Tue, Dec 20, 2011 : 3:30 a.m. Hear hear! When I was a kid we used to play with mercury, lead soldiers, and toy guns that not only looked real but could be easily modified to fire bullets we casted ourselves in a &quot;toy&quot; furnace. Those were the good old days, when kids were free to learn about risk and personal responsibility, without government supervision. The free market already has a perfectly good way to solve so-called &quot;safety&quot; problems: if too many children die from an unsafe product, parents will stop buying it, and the company will go out of business. Sheesh! I agree. Even thrift shops have to throw out toys they receive because of questionable materials being used by China. Although we found two Fischer Price dolls we were looking for and kept them from the trash heap. I also say if you have stuff animals? HS and ASPCA will take them. They are needed for their puppies and kittens displaced by puppy mills. Mon, Dec 19, 2011 : 10:59 p.m. While it is sad to see yet another small business close, sounds like the owners had too much on their plates. They may have closed sooner if not for Riders shouldering some of the burden of rent and utilities.. Hope that Riders can still make a go of it. Good luck to all small businesses in Michigan! Mon, Dec 19, 2011 : 10:45 p.m. Sad to hear about this development, after doing a wonderful thing by allowing your employees to enjoy the Thanksgiving Holiday and, early Black Friday Morning with their families. Also, pleased to hear that your warehouse/shipping logistics business is doing well. The sad thing is that small businesses aren't getting the support (tax wise) from our state that can assist them with staying open because, state funded tax breaks are going to the mega/extra large corporations. Good luck with your future endeavors. Mon, Dec 19, 2011 : 10:34 p.m. Very sorry to hear this, shopped there on a regular basis and always found great toys. Mon, Dec 19, 2011 : 10:05 p.m.
Hans and Tricia Masing's store will sorely missed. Not good news at all. Mon, Dec 19, 2011 : 9:04 p.m.
Another great store that was keeping Ann Arbor from become just another mediocre town, which it is fast becoming. Mon, Dec 19, 2011 : 10:09 p.m.
Mon, Dec 19, 2011 : 9:01 p.m.
Oh no! That's such a cool store!!! Mon, Dec 19, 2011 : 8:39 p.m. Weren't these folks just chosen as the favorite toy store in the area? I looked forward to visiting them for the next grandchild's birthday. Mon, Dec 19, 2011 : 9:53 p.m.
D'oh! Of course we love Lexi's - the bunnies are awesome! Mon, Dec 19, 2011 : 8:57 p.m.
Hans, please don't forget Lexi's Toybox! It's a wonderful little place, with inventory that is quite unique. Mon, Dec 19, 2011 : 8:50 p.m.
Mudpuddles in Kerrytown took the crown this year for AnnArbor.com's &quot;Best Toy Store&quot; - and they deserve it! When we are gone, we encourage folks to go there and to The Little Seedling on the west side. They'll keep the fire lit for awesome toys in Ann Arbor! Mon, Dec 19, 2011 : 8:30 p.m.
Mon, Dec 19, 2011 : 7:50 p.m. I mus say that, given the shopping spree they provided the 7 year old a few years ago, I WANTED them to succeed. However, I have become increasingly disappointed in the store. Their inventory and service have been slowly declining. Recently, a family member went there for a special item offered in their catalog, only to be told they didn't have it. The staff explained that the item was very hard to find and that they didn't know IF they would ever be able to get it in stock. Why would you list sale prices for an item in a catalog if you didn't even know if you would ever stock it? This was, unfortunately, one of multiple stories I have recently heard about their poor customer service. Given they are shutting down their store and can only give a firm &quot;MAYBE&quot; about the future of their online business, I certainly wouldn't go and spend any money at their site. Sounds like a &quot;they took my order and never delivered&quot; story waiting to happen. I hope they are able to turn things around for their other businesses. Mon, Dec 19, 2011 : 8:48 p.m.
Mon, Dec 19, 2011 : 6:38 p.m.
Hans, thank you for all you've done for the community! TTT will be missed for sure. I encourage people to keep shopping local at our other small childrens' stores -- Lexi's Toybox on Ashley is wonderful! Also Mudpuddles, Little Seedling, Grow With Me (second-hand and great), and the Learning Express franchise too. Am I missing any? Mon, Dec 19, 2011 : 6:21 p.m. I find everything I am look for at Mudpuddles in Kerrytown. I went there on Saturday and it was so busy, but fun! Mon, Dec 19, 2011 : 6:53 p.m. I am a huge fan of the Mudpuddles folks! They are awesome! Mon, Dec 19, 2011 : 6:06 p.m.
Best of luck in your online endeavors, Hans. And sincere thanks for giving Kathleen Edward a day that she -- nor any of the supporters who were there at TTT the day of her shopping spree -- will ever forget. It was a truly inspiring gesture of compassion and kindness. In Ann Arbor, you have a lot of highly skilled, motivated people who want a retail business where they hope they will personally connect to the community. Eventually the reality of NNN (lease overhead), regulations that favor large competitors and week after week writing checks to payroll rather than to ones self or spouse, disabuses them of their romantic notions about small business as they realize that they are going to have to get larger and serve a larger (national / international) market or go out of business altogether. So, thank them for their effort and wish them luck in their surviving business model. In Ann Arbor there is always anther crop of the young and idealistic that will bring us another season with new retail options. Mon, Dec 19, 2011 : 5:32 p.m. This was once a terrific toy store, but it seemed that the Rider's inventory displaced much of the merchandise that drew me to the store in the first place. I realize there are other factors involved in its imminent closing, but I have to wonder whether the toy store might have fared better without the Rider's partnership. Tue, Dec 20, 2011 : 9:46 p.m.
@fjord: maybe the items you are wanting to buy are available online. I so wanted to see this joint venture succeed - retail as we know it is changing. It's going to take this kind of &quot;out of the box&quot; thinking for all retailers to grow and adapt to the competition from the online businesses. There are many reasons a business fails but I highly doubt the joint venture/shared space contributed to TTT closing. Since we don't know all the behind the scenes information, we can only go by what they presented as the reason for closing. In theory both business should have seen a growth in customers, not a decline. But if many of their customers felt as you did, it's a shame...support local businesses, otherwise they all will soon disappear. Tue, Dec 20, 2011 : 1:51 p.m.
@rileyzma: It's not just an impression. The addition of Rider's inventory forced changes to inventory that made Tree Town a far less interesting toy store. You simply cannot cede that much floor space to new items without sacrificing space for other items. Sadly, what was sacrificed was largely the kind of item I had long gone to Tree Town to purchase. That stuff was once there; Rider's arrived; that stuff was gone. Displaced. Tue, Dec 20, 2011 : 3:11 a.m.
My husband said that Tree Town also sold some of the same things Riders did. Although I am not sure of the pricing. I hate to say it, but Riders can not get a break to save its life. Good luck to Riders. Mon, Dec 19, 2011 : 11:03 p.m.
Not according to what the owner sites as reasons for closing. As for displacing inventory, it was more likely consolidation that gave that impression. Our family really loved this toy store. I'll be very sad to see it go. Mon, Dec 19, 2011 : 5:23 p.m.
Mon, Dec 19, 2011 : 5:22 p.m.
Mon, Dec 19, 2011 : 5:10 p.m.
Ah, this explains my puzzlement when I went in there on Saturday, and thought the inventory was very low. Walked right out and went to a larger toy store and found everything I needed. Hopefully, they will do well on-line. I always was a fan of this toy store since they helped that little girl who was ill and being harassed. That was a very touching story and so kind for this store to help her.